Peter did not understand why his resurrected Lord asked him three times to affirm his love. He thought that the Saviour was chastising him. Christ knew, though, that the man who had denied Him three times on the night of His crucifixion needed to affirm Him three times to atone for his actions. I often reflect on this story as an example of the depth of Christ’s love. I imagine that the Lord knew that Peter, wracked with guilt over his betrayal, could not forgive himself. In a moment of fear and confusion, he had abandoned the core of his identity and betrayed the person he loved the most. Without his faith in Christ, he was not even Peter. He was Simon, son of Jonas, and nothing particularly special. By giving Simon the opportunity to disavow his rejection of that faith, Christ gave him a way to reclaim his discipleship–a way to become, once again, Peter, the Rock of the Church. Christ, in effect, gave Peter a do-over. It is something that we all need from time to time. And it is also something that nations need when they stray from the values that make them who they are. The American people have been beautiful and wise at times, but we have also been foolish and ugly. We have, like Peter, betrayed the better angels of our nature and allowed ourselves to give in to the fear and confusion that make us small. We gave into such a fear 73 years ago, shortly after the bombing of Pearl Harbor, when we allowed more than 100,000 American citizens of Japanese ancestry to be stripped of their property and locked away in relocation camps. We were afraid. They looked like the people we were fighting, and we determined that it was better to violate the rights of an entire group than risk the chance that even a few of them would sympathize with our enemy. It was a test of our comittment to our own values, and we flunked. And now we appear to be starting down the same road again. Presidential candidates who might actually win are openly saying that they will close down mosques, track citizens in a database, and require people of the Muslim faith to carry identification cards. More than half of the nation’s governors, exceeding their Constitutional authority, have declared that their state will not accept Syrian refugees. And our Congress is doing everything it can to force America to abandon its committment to the internatuonal community–and to our own values–to resettle the most desperate victims of the very forces that we are fighting. Beneath all of the horrors of past few weeks, however, lurks an amazing opportunity: the chance to repudiate our past actions and try again. We can reject those who want to manipulate us through our fears to be our worst selves and summon instead the better angels that define us at our best. Like Peter, we are getting a do-over. A chance to atone. And the conditions of our expiation are exactly the same: we must feed His sheep. Keep on speaking truth, Mike! Woah. One of the best things I have read at BCC ever. Thanks. Fear. Yes fear. As a British person looking in it seems fear motivates so many American positions and actions. When I heard the my country, the home of the free and the brave and a land so large we have states larger than many Eurpean countries, was only willing to help 10,000 refugees when there are millions in need I was troubled. When I heard that my country men and the leaders of this nation would rather give into fear than even help the paltry number we have offered refuge to I was heartbroken. I just wish there was someway I could reach out my arms across the ocean and offer those in need some respite and safety. Oh Lord, God forgive us. That picture should sear into our hearts the call to repent and take action. Those who are asking for a “tougher vetting” of refugees should realize that refugees are already seriously vetted prior to entering the U.S.. There’s a reason the 9/11 terrorists were all here on visas (mainly business and tourist visas) and not as refugees. The real threat, of course, is that the U.S. is giving in to fear–which is exactly what ISIS was hoping we’d do. What amazes me the most, however, is that countries like France and Germany, where the vast majority of people are only nominally Christian, are acting much more Christian than the much more religious United States. They’re more compassionate and more brave than we are. It messes with the parallelism you are striving for, but one reading of Jesus telling Peter that he will deny Him three times can be read that Jesus was telling Peter to deny Him three times, to prevent Peter from getting killed and/or to permit Peter to be present as a witness of what happens. Spencer W. Kimball was apparently persuaded this was the proper interpretation (vice it merely being something Meg Stout made up). My foreign-born father often felt that he was less trusted because he was merely a naturalized citizen. As a civil servant, he took quite a lot of comfort in pointing out that the famous insider threat/spy folks were white Americans. Listening to the recent stuff, I was reminded of a story I heard from a friend, who had been born in South East Asia. She was in the leading wave of refugees trying to enter the neighboring country (I think she was fleeing Cambodia, trying to enter Laos). The Laotian soldiers met the refugees at the border. But rather than welcome them in, they pointed their guns at the refugees and told them the border was closed. A woman, unwilling to face returning, stepped forward. My friend watched as the soldiers shot the woman to death, letting the body tumble down the side of the mountain. I forget the details of how my friend eventually escaped Asia and got to America. The problem with Americans is that most don’t really consider the Syrian refugees (or Asians back in the day) as part of their extended family. I seem to recall the US Government putting all persons of Japanese descent in camps during World War II. And I recall the US Government sending a plurality of it’s armed forces against a “rogue” group of refugees in the western mountains circa 1857/8. So on most days the US people and their government are the best of people. But from time to time they are xenophobic and paranoid folks who will go on to have to apologize in some future time. Wow. Thank you for this, in particular, that final and Moving paragraph. We have good vetting we don’t need to worry about; until something terrible happens again and there is banal clamoring to look into what went wrong with our vetting program. Hundreds dying is is a terrible price to pay for discovery we need tweaking of the vetting parameters. Ignore that a government official in Greece just said we can’t vet them unless they are already in a database. Ignore that those already in a database can just change their reported identity and lie and or bribe their way in as literally just happened. Ignore that a boat, similar to that one picture perhaps, dumped 12 of Christ’s sheep overboard. That must have just been one random boat though (oh, and mountain meadows!). I’m not sure what’s more troubling – if that group was a bunch of terrorists or if not and they truly just hate their Christian counterparts and want to live a peaceful life? Next, ignore that you aren’t feeding the Lord’s sheep in his own way. We aren’t passing them by on the street. They aren’t even showing up destitute in need. We are spending tens of thousands per individual to vet, bring them here and establish a residence then monitor them, after they’ve already made it safe somewhere (Turkey, Greece, elsewhere in Europe). The President refuses to go to war because he feels it won’t fix the root cause. We should refuse to go to great expense importing starving sheep, when the root cause is still not solved. What to do? Help them closer to home. Less people will get in the boats to begin with and you can help more people, more effectively. It’s far cheaper to help 100 of the truly needy in Turkey than helping and monitoring 10 here. And that doesn’t even factor in that millions will yet come unless the conflict is solved. Who is proposing to solve the conflict, the captain of or varsity team (how)? And let’s assume that we somehow were to do the impossible and bring in all the sheep and none of the wolves (or even tolerate more “random”, “lone wolf” attacks). Once that area of the world is rid of the sheep, don’t you think it’s possible they’ll send more who lie their way in to continue attacks? So clearly the root cause must be solved. Oh, and why does France and Belgium have such a home “grown” (imported) problem anyway? Somehow giving housing, healthcare, opportunity and money didn’t stop this ideology from growing internally. I’d be a lot more trusting of those offering to feed these particular sheep, if our leaders not only demonstrated these are valid questions, but could answer them sufficiently. Finally, it’s tragic the captain of the varsity team and the ostriches with their head in the sand who lead in Europe let this problem develop. Having a military presence in Iraq, no fly zones over Syria, following up on the red line threats, all would have stopped this. Remember, after Iraq, Libya actually turned over their and program. Remember the violence had declined before the varsity captain pulled out. Remember we didn’t leave ten years after Germany, Japan, or Korea. Why? Because it would have re-empowered the radical elements. Because we don’t have the generational patience to outlast the radical elements of their culture, they turned our gains into losses and made that area of the world worse than before. This is not an issue that can be answered with platitudes. In other words, Ohna, they are not our neighbor. We have no obligation to help anyone but ourselves. If we serve our own communities, we can pat ourselves on the back for our isolated Christianity. These refugees are someone else’s problem, not ours. If they die, so be it. The parable of the Good Samaritan is a warning example of the financial cost of assisting others. I’m sure Christ will understand why you and the rest of America felt that your own comfort was more important than their lives. Ohna, I’m sorry I triggered you into writing all those paragraphs. I’m sure there is much truth in them. 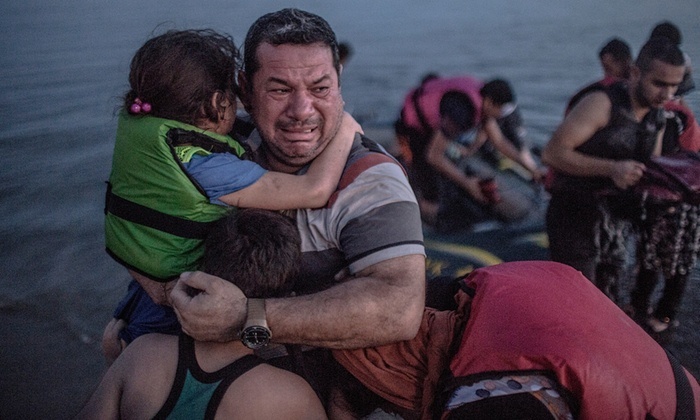 But in my heart there is a desire first to help the man and child in the picture above and the thousands of others like him, and at the same time, applying our wisdom to weeding out the bad guys. We can do both. I just have an affinity toward taking the command and plea, “Feed my sheep” as seriously as we possibly can. Even in our blog comment rhetoric. MDearest, I have more confidence in and respect for your heart and your charitable response than in … well, than in alternate contentions. Thank you. I am embarrassed for the Democrats, who know better. I am appalled at the Republicans, who, from where I stand, can’t seem to get anything right, so this is merely par for the course for them. James S., you beat me to it–I love that poem. It perfectly captures what America could be, a shining beacon of hope and freedom. Alas, we so rarely live up to that dream. Doesn’t mean we should stop trying, though. To those who think that letting in refugees is “risky”–well, living like a Christian is risky! Wouldn’t be much point in it if it were easy. I have begun despairing, saying that I don’t recognize my own country anymore, but as you point out, we interred Americans of Japanese descent during WWII, and turned away Jewish refugees in the run up to the war, afraid that they might be German spies. Not to mention our century-plus war against Native Americans, and the current attitude by most of our presidential candidates regarding Mexican and Central American immigrants, and I realize that I do recognize my own country, and I am ashamed of it. We can do better, and we better keep speaking out. We can be awful at our worst, but magnificent at our best. This is just not our best moment as a nation, by a long shot. The US has the capacity to accept 10,000 refugees per Obama’s plan. The US has the capacity to alter the course of the war. So what should we do? Can we (with Russia, Iran, Europe, Arab allies, etc.) craft a solution that makes sense? Can we stop making things worse? Leadership? Diplomacy? Military engagement? Do we have the wisdom and the will to get this right? We have our own problems in this country and we are $18 trillion in debt. How about we fix ourselves before we arrogantly think we can fix the world’s problems.